Pakistan today started off against Egypt with high spirits. 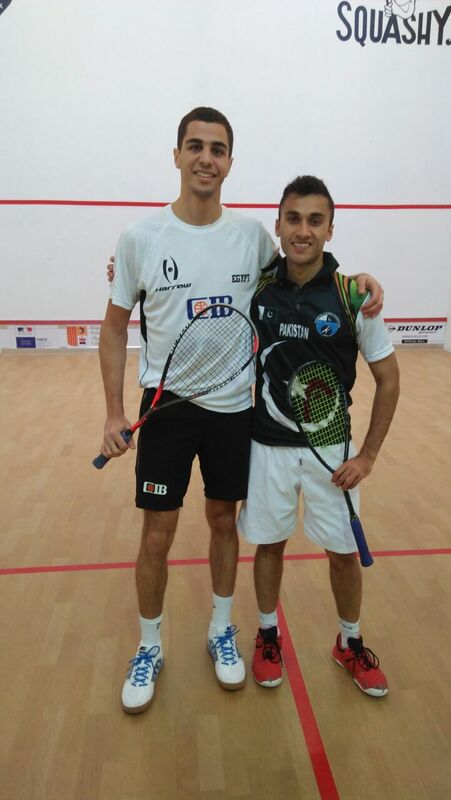 Amaad played against Shorbagy, Shahjahan played against Farag while Farhan Zaman was pitched against Abdul Gawad. Amaad bore the pressure of playing 1st match against the world class Marwan Shorbagy No 11. Amaad tried his best in first 2 games but he got into the game and was 5-3 up but made few unforced errors and finally lost by 3-0 (4/11, 5/11′ 6/11) in 25 min. Shahjahan was the next to play against Ali Farag No 6. Losing 1st two games, he picked up his pace & gave a strong fight to Farag building up pressure but finally lost by 3-0 (3/11, 4/11, 7/11). Finally, Farhan Zaman started against World Champion Abdul Gawad and showed his gallantry skills. Entire arena got crowded to see the action as in 2nd game Farhan was up by 10/8 but lost it at 11/13 due to better skills. After first 2 games Farhan bedazzled the crowed by winning 3rd game from Gawad by 11/7. In 4th game Gawad proved his might & won match by 3-1 (11/7, 13/11, 7/11 & 11/4). Pakistan lost 0-3 against Egypt the title favourites . Now the team needs to beat Switzerland to make it to the top 16.